For 40 years, the tallest building in Los Angeles was City Hall. Completed in 1928, at the peak of the city's most frenetic decade of growth, the architectural masterpiece stands 138 meters (453 ft.) above the downtown streets. It's been used as a filming location for many movies and TV series. 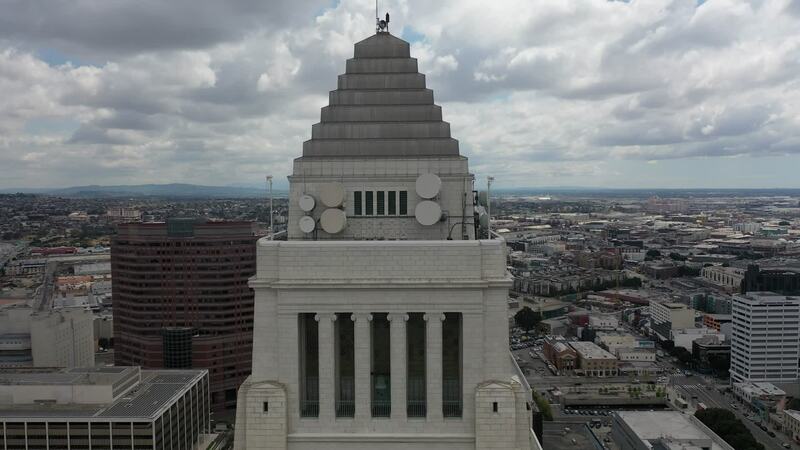 In its best-known movie appearance, City Hall "stood in" for police headquarters in the 1997 modern noir classic, LA Confidential. You can see City Hall from a drone perspective in this video by mavictraveler. Description: I've always thought LA's City Hall was one of the coolest looking buildings. Had a chance to drone it so I took it. Shot with Mavic Pro 2.